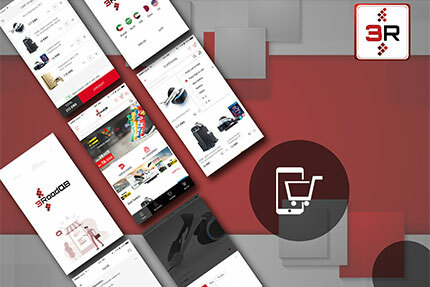 Creativity is a premium mobile application and web development company based in Kuwait since 2009. Our vision is to provide high quality services to our clients. We have developed cloud based customized software for different industries by applying best-in-class technology by assigning a highly skilled team of developers. Discover your conversion gaps with us. We shape integrated digital services for every business to drive exponential growth. At Creativity we enhance and convert your raw idea in to the final product to be launched. 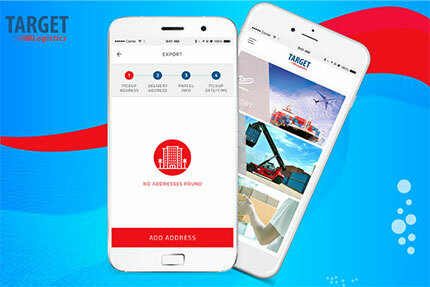 We offer end-to-end mobile application development solutions that can boost your business. Creativity focuses to design and develop functional applications that are sure to benefit and automize your business. We can also help in renovating your existing application. Our expertise in ecommerce design and development can help you launch an online store for your business. Our ecommerce experts are ready to deliver system integrations and full service support. When it comes to the digital world, the user interface should be perfect as it attracts the users. 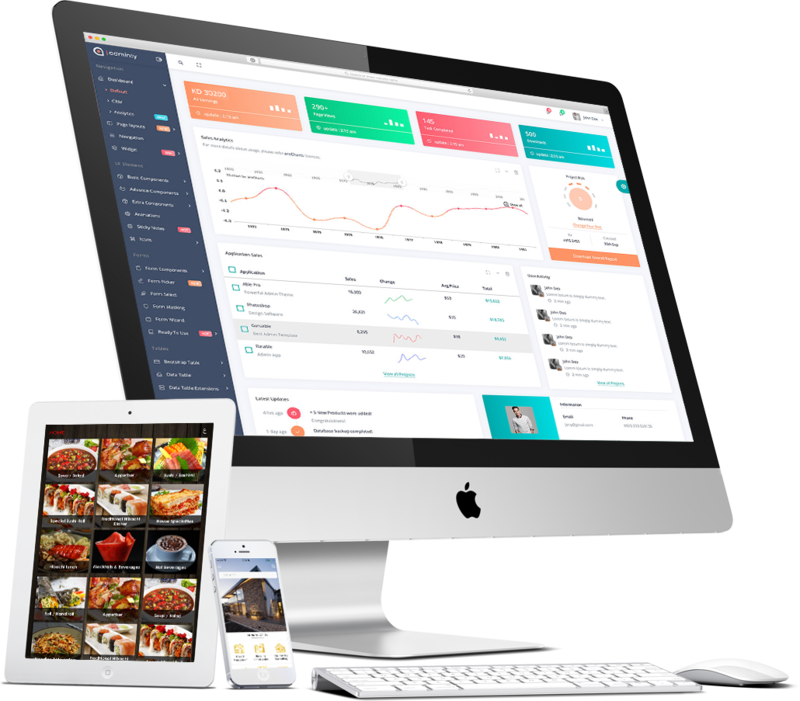 We concentrate more on the interface to help convert users into profitable customers. We look into the functional and non-functional features of your project, as well as technology specifics on multiple platform. We generate a detailed bugs/errors report with test cases that help your developers to fix them. Our expert developers can connect your existing systems to our solutions. Creativity makes sure that your data get transferred seamlessly in a secured way without any loopholes. Excellent results are the outcome of a disciplined work process. While we personalize our plans and its execution according to your business needs, we already have our predefined steps to approach any new project. Below steps have been proven to increase our efficiency at work so that we meet your deadlines and guarantee exceptional results, every time. Creativity considers each project as a unique opportunity and we spend time with you in understanding your requirement. We discuss your expectations about your project. With extensive research and analysis we prepare Software Requirement Specifications (SRS) document. The application designer uses the wireframe and your additional input to create the final design for the application, including the screen layouts, colors, and graphic elements. 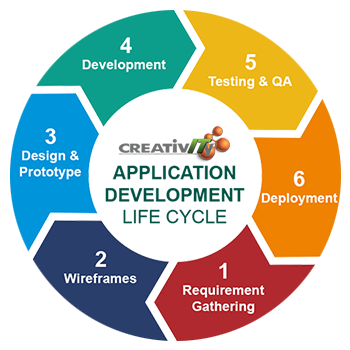 Once design is completed a prototype of your application will be prepared. One can’t truly visualize how a mobile application will actually work until and unless you use it on an actual device. You have probably seen architectural blueprints before. They are a roadmap of the whole construction process. This is basically what a wireframe is for web/mobile app development. The wireframes are the skeleton of a web/mobile app. 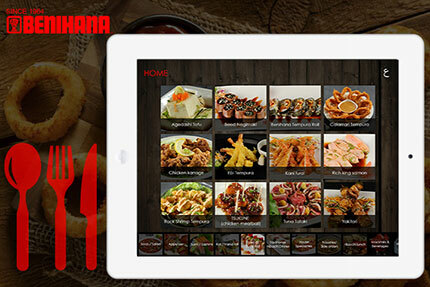 After the first round of development is complete, the application and sample content are loaded to a beta version. Our expert testing team tests the application for usability, compatibility, security, interface checks, stress, and performance. Once we make sure the application is working as per the requirement we involve you to test the application. With the design finalized, the developer can begin building your application and matching the back-end "function" (how a button works, what it links to) with the front-end "look and feel" (how a button looks). 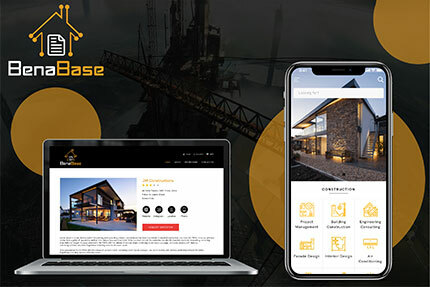 We provide you the actual application with completed modules so you can know how the project is progressing at any point during development. Your app is ready to submit on app stores. App development doesn’t end at launch. As your application gets in the hands of users, feedback will pour in, and you will need to incorporate that feedback into future versions of the app. Every app will need updates and new features. Typically, as soon as the first version of the app is released, the development cycle begins anew. Our Passion. Your Success. We tackle each project with passion and determination. We work hard to turn heads for our clients. Here are a few of our latest projects that not only deliver great experiences, but have elevated results.